If we adopt an approach to safety that is focused on controlling others then banning things in the name of safety is a perfect solution to dealing with the grey, messiness and ambiguity of risk. There is no grey in banning something, right? 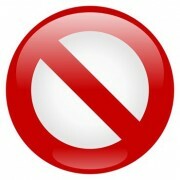 Have you heard of the ‘Banned Objects Index’ (BOI)? It is the latest ‘measure’ that you can use to compare your organisations safety culture against another. The ‘BOI’ is easy to calculate, it’s simply the number of banned objects (for safety reasons) per full time equivalent employees. The higher the number, the better the safety culture. Sounds pretty simple right? Could ‘BOI’ be the elusive ‘Positive Performance Indicator’ we have all been searching for? Word in the industry is that Government are considering a national ‘BOI’ target and an associated strategy for achieving it. The country’s leading safety body, the Stupid Incident Again (SIA) are reportedly forming a Committee to review the concept, with one insider leaking that the BOI is just what the industry has been searching for. Some suggest that it could even replace Zero Harm as our key aspirational safety target as it’s so much better to have a positive number as a goal. It also means that the risk and safety industry would have access to a great new range of charts and diagrams where finally safety numbers can go up instead of down. Business is more likely to take our message seriously when we finally have a positive performance indicator that makes sense. Onwards an upwards in safety….. This all sounds pretty silly right? I mean why would any organisation think that the number of items banned from a site could be an indication of safety culture? In fact, why would an organisation think that they could in any way get a feel for culture through the use of any (apparent) objective measure? Did someone mention LTIFR? I guess if your tools of choice in ‘enforcing’ safety are control, rule and fear, then a BOI might make perfect sense in measuring culture. If we adopt an approach to safety that is focused on controlling others then banning things in the name of safety is a perfect solution to dealing with the grey, messiness and ambiguity of risk. There is no grey in banning something, right? Do we really understand the psychology of risk?